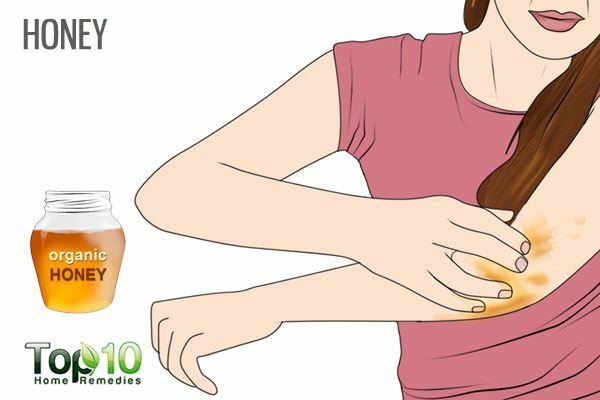 As soon as the winter chills come knocking, many people with naturally dry skin start to fret about one key problem area that typically gets aggravated during this time of the year: their elbows. Dry and scaly elbows are a common yet discomforting skincare complaint, which, if not tended properly, can turn severely itchy. The skin around the elbows is much thicker than on the rest of the body and has fewer oil glands to keep the skin moist. Due to these basic structural drawbacks, elbows produce relatively less amount of the vital lipids required to retain water and keep the surface skin naturally moisturized. This is further compounded by the chilly and arid climatic conditions associated with winter. Frosty as it may be, winter air is grossly devoid of any humidity, which means that your dry skin can’t supplement its moisture needs from the environment. The resultant chipping, flakiness, and scaling of the skin compromise the protective function of its epidermal barrier, making it progressively more vulnerable to unwanted external irritants. Although weather remains the prime culprit, several other factors can also lead to the drying and scaling of your elbow skin. Frequent movement when bending your arms makes the skin around the elbows susceptible to becoming dry, scaly (crusty), and rough. In some cases, dry skin may even be symptomatic of an underlying medical condition, including diabetes, eczema, scleroderma, dermatitis, and psoriasis. Wearing coarse fabrics such as wool during winters can cause friction between your clothes and the elbow skin, thereby making the skin dry and scaly. People who are in the habit of resting their elbows on rough, hard, or concrete surfaces for prolonged periods generally tend to have dry, scaly elbows. Insufficient water intake can lead to general body dehydration which paves the way for dry and scaly elbow skin. Smoking also contributes to increasingly dry and scaly elbows. People undergoing hormonal changes, such as during menopause, are especially prone to this condition. People suffering from hereditary conditions, such as eczema, show a tendency to develop dry and scaly elbows. Use an emollient cream to help keep your skin hydrated and to provide a barrier that seals in the moisture. Emollients contribute to the reduction of transepidermal water loss. Drink plenty of water to keep your body and skin hydrated, but avoid sugary sodas, juices, and caffeine, which may make skin conditions worse. Include healthy fats in your diet to help hold moisture in your skin, keeping it supple and soft. Use only lukewarm water when taking a shower or bath, as hot water will dry out your skin even more. Avoid using too much hot water and chemical-based soaps to wash your elbows. Soon after taking a shower or bath, gently pat yourself dry with a soft towel and apply a good moisturizer to seal in moisture and help prevent the skin from drying out. Wearing suitable clothing will also help prevent your elbows from drying out due to cold weather. Natural fibers such as cotton are recommended to avoid irritating the skin. Do not use harsh soaps and skin care products that may irritate the skin and cause dryness. Don’t over exfoliate or scrub your skin too roughly. It will only strip your skin of important natural moisturizing oils. Choose your moisturizer carefully, checking the ingredient list. Steer clear of those containing chemicals. Before going to bed, apply moisturizer on your elbows and cover them with soft tube socks to let it work on your skin overnight. If you’re experiencing a lot of problem with dry skin, keep the temperature in your home slightly cooler. Use a humidifier to add moisture to dry indoor air. Avoid swimming for a long time in chlorinated water and make sure to take a quick shower afterward. If you have severely cracked skin on your elbows, it’s important to consult your doctor. There’s usually no real need to rush to the doctors to treat something as innocuous as a case of dry and scaly elbows. Keeping your skin adequately moisturized along with proper water and dietary intake should suffice to alleviate the dryness and itchiness to a great degree. However, if you fail to get any relief from these self-care measures, you might have to consult with a dermatologist to rule out any other skin concerns or conditions that may be causing the dry skin. Based on your doctor’s evaluation, he may prescribe strong topical ointments or creams to deal with the dryness. If he suspects a systemic disease at the base of your skin condition, he will outline a comprehensive treatment approach to tackle the underlying cause and thereby reverse the damage. What makes dry elbows a particularly grueling sore spot is the fact they are always in action. Keeping your hands still at a stretch becomes impossible in the face of daily tasks that, basic as they may be, require some degree of arm and elbow movement. It’s only when you retire for bed that you can expect to give your overworked elbows a break from the constant moving and bending. 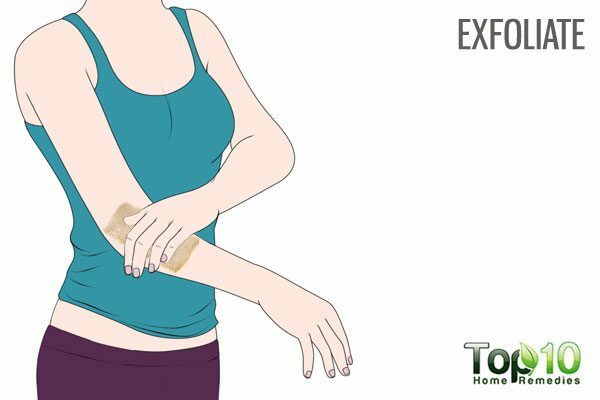 Thus, to work around this problem and prevent the discomfort from getting worse, you may have to proactively care for your elbow skin even if the irritation is still comfortably mild. One must adhere to a strict moisturizing routine for the entire body, but particularly to make up for the lack of lubrication around these overused joints. In the absence of this supplementary hydration, the dry elbow skin, which already runs low on elasticity, is likely to crack under the pressure of relentless maneuvering and movement. If, on the other hand, the problem is addressed right away with proper care, rest, and moisturization, you can help return your elbows to their natural soft and smooth state. 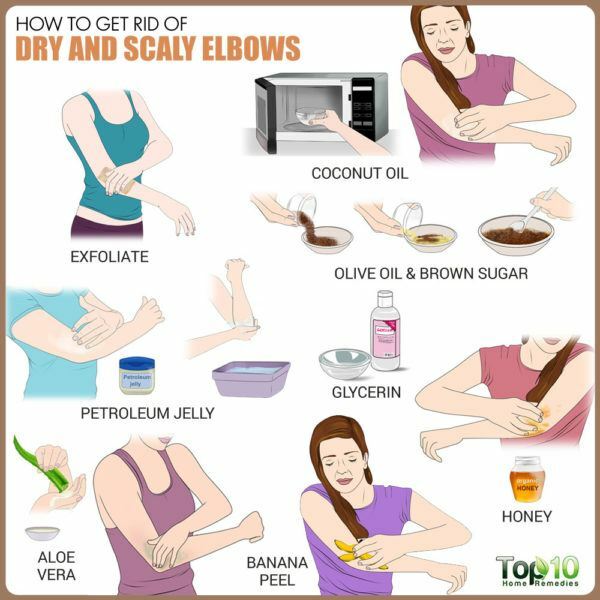 Here are some tried-and-tested ways to get rid of dry and scaly elbows through natural means. Exfoliating your elbows is the first and most important step in getting rid of dry and scaly skin. Exfoliating removes the dead skin cells and exposes the healthy skin underneath. It also works to improve and even out the skin tone. It is recommended to exfoliate while taking a bath or shower when your skin is still moist and warm. You can use a loofah, rough washcloth, exfoliating glove, or a pumice stone to exfoliate the rough skin. Regardless of your choice of exfoliation tool, the method remains the same. Always employ gentle hand movements when scrubbing your skin as rough handling will only exacerbate the problem. After exfoliating, wash the area well with cool water, pat your elbows dry, and then rub in a few drops of olive oil or some moisturizing lotion to restore and retain moisture. Exfoliate your skin once or twice a week only and not more than that. Petroleum jelly, a common item in nearly every medicine cabinet, is another very effective agent to deal with dry, itchy elbows. Its moisturizing property can help combat the dry scales of your elbow skin. Also, this thick emollient forms a shield over the skin and locks in moisture to keep your skin looking smooth and hydrated. Before going to bed, wash your elbows thoroughly with lukewarm water and gently pat your skin dry. 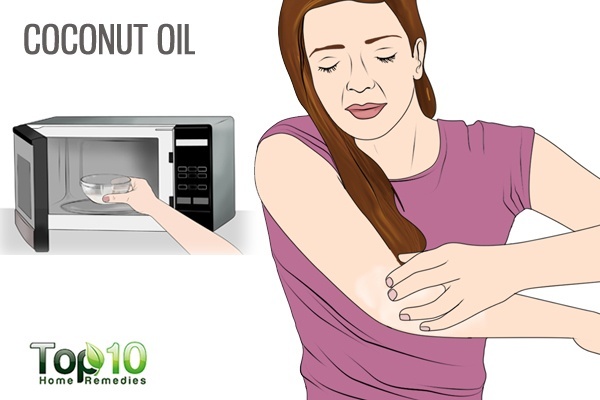 Apply a thick layer of petroleum jelly on your elbows. Cover your elbows with stretchy tennis wristbands and go to sleep. 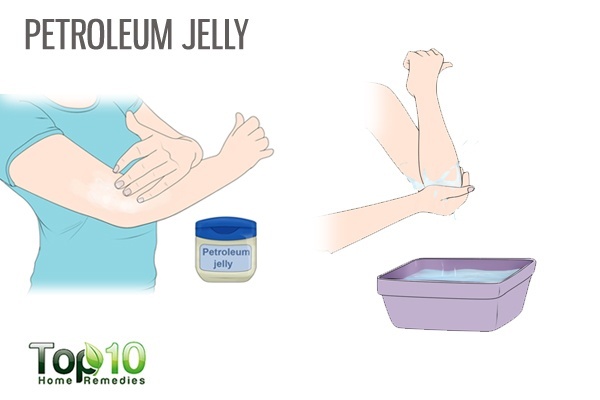 The next morning, use warm water to wash off any petroleum jelly that remains on your elbows. Coconut oil is highly moisturizing in nature and, hence, very effective for treating dry and scaly elbows. The oil is also effective at repairing dark and damaged skin, all thanks to its generous supply of vitamin E.
This essential nutrient can help lighten the skin tone along with reducing dryness. Moreover, this skin-friendly antioxidant helps counter free radical activity, which is responsible for the oxidative stress that renders your skin dull and damaged. Slightly warm up some coconut oil in a microwave. Liberally rub the warm oil on your elbows. Gently massage your elbows so the oil penetrates deep into the skin. Do this after taking a shower and again before going to bed. Do this daily until your dry elbows become smooth. Instead of coconut oil, you can also use olive or almond oil. The gritty texture of brown sugar and the moisturizing property of olive oil make for a safe, well-balanced, and effective homemade scrub. 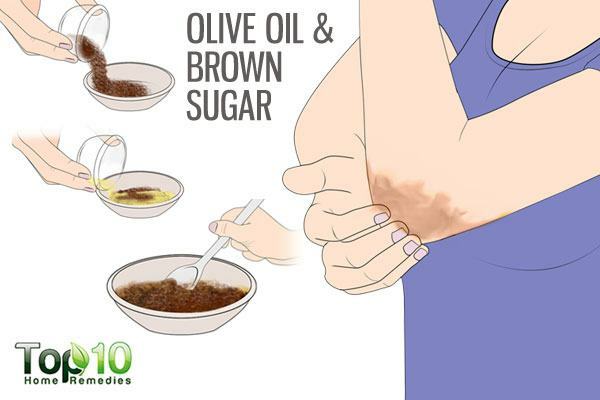 While the brown sugar helps exfoliate the dry skin from the elbows, olive oil deeply moisturizes the skin. In a small bowl, mix ¼ cup of brown sugar with ¼ cup of olive oil. Mix the two ingredients thoroughly until you get a uniform consistency. Massage the scrub into your elbows in gentle, circular motions for a few minutes. Rinse the scrub off with lukewarm water. Use this homemade scrub once or twice a week. 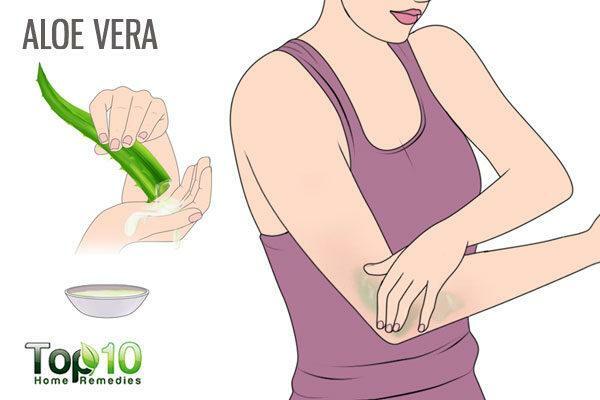 Aloe vera is an amazing natural moisturizer that can help deal with dry and scaly elbows. Not only does this balm help lubricate the skin and seal in its moisture, but it can also reverse any signs of sun-induced cellular damage. Aloe vera gel is also effective in treating and correcting skin discoloration to achieve a more even skin tone. Extract the gel from a fleshy aloe vera leaf. Apply the gel on your elbows. Let it sit for 20 minutes, and then wash it off with warm water. Repeat this one to two times daily for a few weeks. Well endowed with antibacterial, antioxidant, and hydrating attributes, honey is touted as an amazing natural moisturizer for your dry and scaly elbows and rightly so. It penetrates deep inside the skin to keep it moisturized. Also, being a natural humectant, it helps your skin retain moisture. Apply raw, organic honey on your elbows. Repeat this remedy one to two times daily to cure dry elbows fast. Mix together equal amounts of honey and whole milk. Apply it on your dry skin. Wait for 10 minutes, and then take a shower. Repeat this daily or as needed. The soothing and nourishing properties of oatmeal can help deal with dry elbows. It not only exfoliates your skin to get rid of accumulated dead skin cells, but it also softens and moisturizes the skin. The fresh layers of skin that come to the surface once the dead epidermal cells are scrubbed away tend to absorb moisture more readily. Moreover, oatmeal contains a protein that helps prevent moisture loss from the epidermis and thus keeps your skin supple, hydrated, and glowing for longer. This natural skin healer is also known to mitigate the itchiness associated with extremely parched skin. 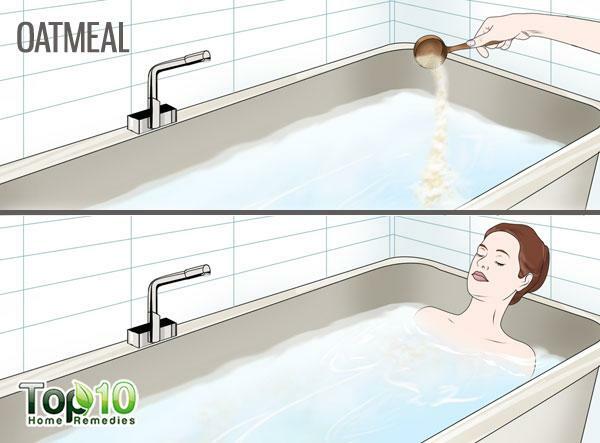 Mix 1 cup of powdered oats into your warm bathwater. Soak your body and elbows in it for 10 minutes. Rinse your body with clean water and pat your skin dry with a towel. Mix 2 tablespoons of finely ground oatmeal with enough milk to make a paste. Apply the paste on your elbows and allow it to dry on its own. Scrub off the paste with cold water and pat your skin dry. Shea butter works as a great moisturizer for the skin and can safely be used to treat flaky or dry skin over your elbows. It contains vitamin A and E as well as essential fatty acids, all of which contribute to making your skin sufficiently hydrated and healthy. What makes shea butter even more of a skin boon is the fact it gets easily absorbed into the skin without leaving a greasy residue. 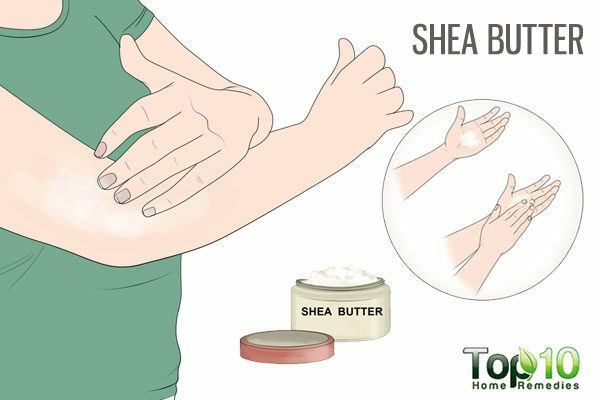 Put a small amount of shea butter in your palm, and rub it between your hands to melt it. Apply it on your dry elbows. Massage your skin with it for a few minutes so that it gets absorbed into the skin. The next morning, wash it off. Repeat this remedy daily or as needed. 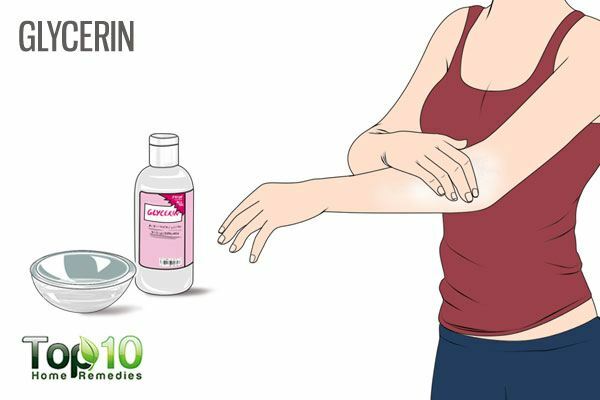 Another common household ingredient that is good for treating dry and scaly elbows is glycerin. Glycerin works both as a moisturizer and as a humectant, which essentially means that this skin tonic not only supplies moisture to parched skin but also helps lock it in. Glycerin has emerged as a beauty mainstay for many and figures as one of the prime components of a number of commercial moisturizers. Mix equal amounts of glycerin and water (or rose water). Apply the mixture on your dry elbows. Wait for 20 minutes before rinsing it off with lukewarm water. Mix 1 tablespoon each of glycerin and coconut oil. Rub it on your elbows and massage them before going to bed. The next morning, rinse your elbows with cool water. The following remedy has done the rounds as a fairly effective adjunctive treatment for mild to moderate skin dryness, despite any scientific evidence to support its merits. Because a number of users have reported noteworthy benefits without any incidence of a negative impact, this anecdotal method is well worth a try. Rubbing a banana peel on dry elbows is also found to be beneficial. The fatty acids in the peel help keep the skin hydrated to reduce symptoms such as dryness and itchiness. Also, the antioxidants in it help correct dark patches of the skin. Moreover, a banana peel also boasts therapeutic properties that might help your skin brave sun damage better. 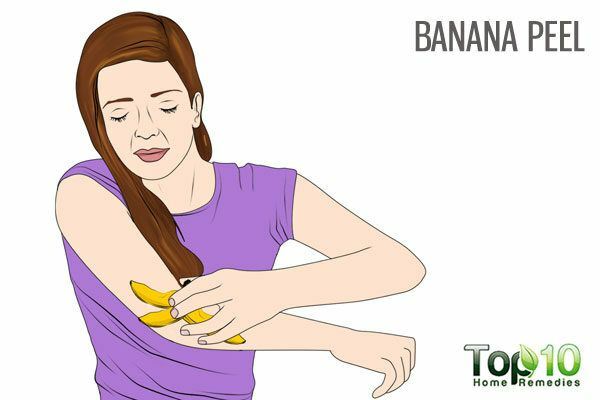 Gently rub the inside part of a banana peel on your elbows in circular motions for 5 to 10 minutes. Let the residue sit on your skin for at least 20 minutes. Reapply two to three times a day until you get positive results. Ichthyosis Care | Bathing & Exfoliation | Foundation for Ichthyosis & Related Skin Types(FIRST). First Skin Foundation. http://www.firstskinfoundation.org/bathing-exfoliation. How to safely exfoliate at home. American Academy of Dermatology. 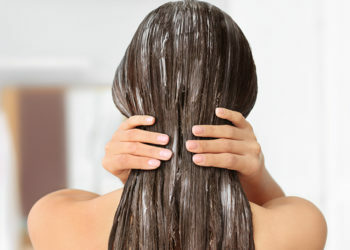 https://www.aad.org/public/skin-hair-nails/skin-care/exfoliation. 5 ways to use petroleum jelly for skin care. American Academy of Dermatology. https://www.aad.org/media/news-releases/petroleum-jelly-for-skin-care. Published January 9, 2018. Sethi A, Kaur T, Malhotra SK. Moisturizers: The Slippery Road. Indian Journal of Dermatology. https://www.ncbi.nlm.nih.gov/pmc/articles/PMC4885180/. Published 2016. Varma SR, Pavan KB, Rafiq M. In vitro anti-inflammatory and skin protective properties of Virgin coconut oil. ScienceDirect. https://www.sciencedirect.com/science/article/pii/S2225411017300871. Published January 17, 2018. West DP, Zhu YF. Evaluation of aloe vera gel gloves in the treatment of dry skin associated with occupational exposure. Plum X Metrix. https://www.ajicjournal.org/article/S0196-6553(02)48212-0/fulltext. Published February 2003. Loone PM, Oluwadun A, Warnock M. Honey: A Therapeutic Agent for Disorders of the Skin. Central Asian Journal of Global Health. https://www.ncbi.nlm.nih.gov/pmc/articles/PMC5661189/. Published August 4, 2016. Criquet M, Roure R, Dayan L. Safety and efficacy of personal care products containing colloidal oatmeal. Clinical, Cosmetic and Investigational Dermatology. https://www.ncbi.nlm.nih.gov/pmc/articles/PMC3508548/. Published November 8, 2012. Narayanan V, Ganjoo A, Kadhe G. Efficacy and Tolerability of an Oatmeal Moisturizer Containing Colloidal Oatmeal for Dry Skin Conditions: A Post-marketing Study. DERMATOLOGY. https://www.researchgate.net/publication/326440013. Published June 2016. Malachi O. Effects of topical and dietary use of shea butter on animals. American Journal of Life Sciences. https://www.researchgate.net/publication/277021242. Published 2014. Shea Butter. ScienceDirect. https://www.sciencedirect.com/topics/veterinary-science-and-veterinary-medicine/shea-butter. Published 2015. Fluhr J, Darlenski R, Surber C. Glycerol and the skin: Holistic approach to its origin and functions. British Journal of Dermatology. https://www.researchgate.net/publication/5339621. Published August 2008. Glycerin may help skin disease, study finds. Medical College of Georgia at Augusta University. https://www.eurekalert.org/pub_releases/2003-12/mcog-gmh120203.php. Published December 2, 2003.